The buses pull up, discharging loads of students. The bell rings. Bulletin boards are decorated, lesson plans are being created. I know, it’s too early to mention that “s” word, school, but it’ll be here before you know it. If you’re a teacher, September brings with it all kinds of challenges. But if you’re a teacher with a voice problem, those challenges can truly be daunting. How can you protect your voice from further damage? And how can you get your voice healthy, and keep it that way throughout the school year? Here’s an idea: let’s talk about my five Voice Rules for Teachers. They’re easy to remember: they spell out “TEACH”! Rule #1: T stands for “Take Voice Naps”. A voice nap is a brief break, 5 to 15 minutes (or more if you are able) where you don’t talk or sing at all. We have found that vocal conservation is more effective than voice rest. Voice naps are one way of conserving your voice throughout the long school day. So, allow your students to work independently for a few minutes, let them take turns reading aloud, or ask your teaching assistant to run a group activity. During lunch, a voice nap would be taking a walk or eating in a quiet space, instead of eating in a noisy teacher’s lounge or diner. After work, a voice nap could be sending emails or texts instead of making lengthy phone calls. Rule #2: E stands for “Employ Non-Verbal Means to Quiet Students. This means no shouting over the students’ loud speaking or singing. Try clapping, flicking the lights, using a bell or even a small percussion instrument. There’s even an app called Service Bell, that simulates the sound of the old-fashioned silver bell on a counter in a store. For you music teachers, play a set musical pattern on the piano that signals to the students that they need to quiet down and focus on you. You could always try the old “stand in front of the classroom, arms folded, with that ‘I’ll wait’ expression on your face”. Eventually a student will notice and one by one, the room will quiet down. If you want to think creatively, nominate one student per day to be the Noise Monitor; you can delegate the room-quieting responsibilities to that individual. If you share with your class that you’re having a voice problem and want to engage their help to protect your voice, they’ll be more than happy to be your ally. Rule #3: A stands for “Amplification is a MUST!” Now, I’ve heard every excuse there is from teachers who don’t want to use amplification in the classroom. But studies have shown that amplification is hugely important in protecting the teacher’s voice from vocal strain. It may even help students to hear and process verbal language more effectively. Many of the personal amplification systems we recommend are body-worn, either on a belt clip (Voice Saver: http://www.califone.com/products/pa283.php) or in a fanny pack (Chatter Vox, which is on our Amazon-affiliated website store, https://provoicecare.net/recommended-products/singer-resources/). Rule #4: C stands for “Cut Down on Loud Voice Use”. This seems to happen so much in a school setting. Talking over students, singing over a chorus, coaching a sports or physical education activity, running an after-school club, calling someone down the hall, or being on bus duty or lunch duty. But using a forced loud voice production can really crash your vocal cords together and potentially damage them. Remember these wise words: if you’re not getting paid to do something with your voice (in this case, being loud), DON’T DO IT! I always ask my clients who teach, “Do they increase your paycheck if you push your voice loudly at work?” But if you lose your voice, there might not BE a paycheck! So, go back to Rules #2 and #3 to help make Rule #4 a reality. Remember, if you have a microphone, there’s no point in talking loudly into it. This defeats the whole point of amplification. Speak in a more confidential tone. If you’re running outdoor activities, use a bullhorn and/or whistle. Rule #5: H stands for “Have Lots of Water”. Wet vocal folds are happy vocal folds. You will need less force to drive the vibration of wet vocal folds vs. if they’re dry. Schools are dry to begin with, what with forced air heat, dust, poor ventilation, etc. You need to combat this with at least half your body weight in ounces of water. Fruits, herbal tea, and fruit-infused water are great too. Use a humidifier in the winter if you are able to in class, but definitely at home. Facial steaming is also helpful for keeping your cords moist. And increased hydration and steaming may help to keep all your mucous membranes healthy – and maybe ward off the dreaded school respiratory infection! 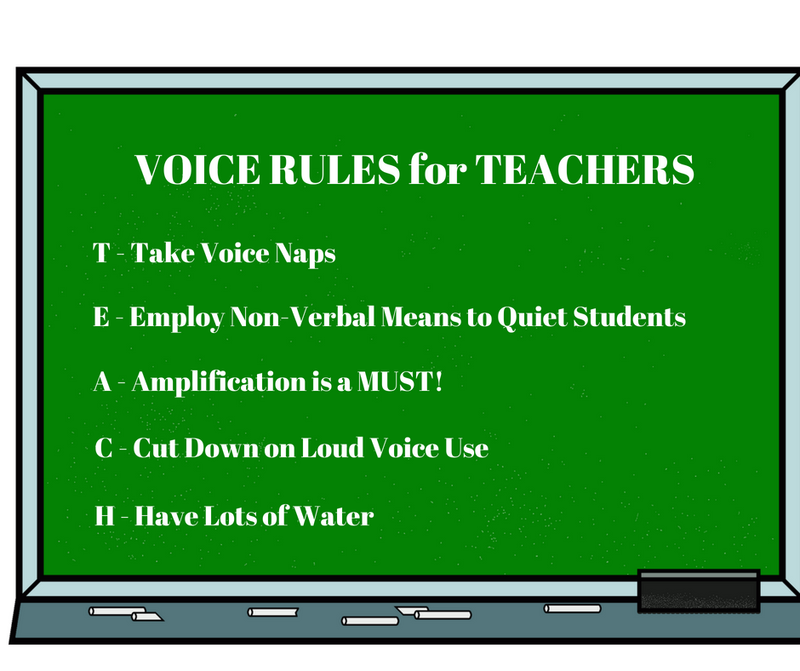 These Voice Rules for Teachers are just a starting point. There’s much more you can learn by attending voice training or voice therapy with a qualified vocologist, a speech-language pathologist with special training in the care of the voice. Some of these concepts might include learning how to warm up your voice before, during, and after school (remember, especially those of you who sing, teaching is another performance, so you need to be warmed up! ), how to use good breath support, how to relax tight muscles, and how to use good seated and standing posture. If you’re already having voice problems, and the thought of teaching 6-8 hours a day scares you, schedule a voice evaluation today. Don’t wait until October 1st, when so many teachers realize they’re in vocal crisis. Take action now to prevent or hopefully reverse vocal damage. Happy teaching!